Las Vegas Superior Tree Service is always available to provide emergency tree service. Thunderstorms or ice storms can cause major damage to your trees. closed, press 9 and you will be connected to the Supervisor on call. We can have an estimator at your home or place of business within 1-2 hours, and he can mobilize a tree removal crew on the spot. Our crane operators and tree care employees are experienced in the delicate job of removing a fallen tree without further damage to your property. In the event that a storm takes place and you have a tree hazard, Las Vegas Superior Tree Service specializes in these types of scenarios. With over 7 years experience in providing emergency tree service, Las Vegas Superior Tree Service has the resources and expertise to handle any type of tree removal. 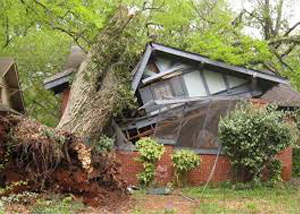 If a large tree is on your structure (home, car, etc), contact Las Vegas Superior Tree Service to have it removed. Trees that are decayed, are dying, or already dead are more prone to fall during extreme weather conditions such as high winds. This is why customers who have potential hazardous trees should take preventative action to have them removed before a storm strikes.